An aerial shot of the Wellspring Edmonton facility. 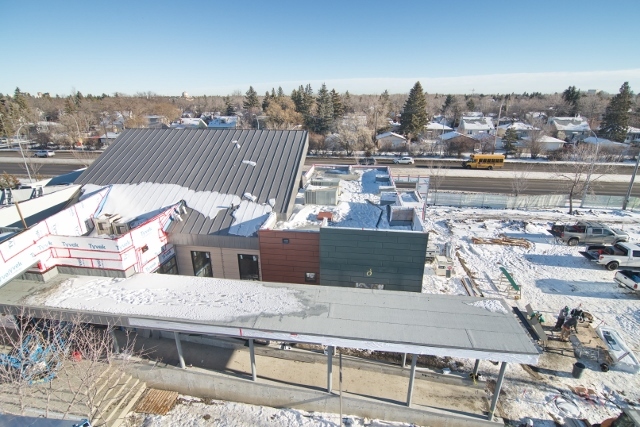 Passersby during morning and evening commutes along 113 Street in Edmonton are already getting a big preview of things to come with the Wellspring Edmonton facility. Construction workers have installed protective cladding to the exterior of the building, which will protect the structure from the extreme climactic conditions Edmonton experiences throughout the year while providing a unique-looking building to the neighbourhoods of Belgravia and Parkallen. The building embodies the generous support and goodwill of Edmonton’s philanthropic and building communities. Wellspring Edmonton this month wrapped 12 Days of Gratitude to major donors and builders on Twitter and Facebook, thanking each one for their support (we recommend clicking on the latter links and visiting our social media accounts to see who they all are). Click on the gallery below and see the latest work on the building.